I plan on making some good progress this week. My wife is out of town on business. My kids are gone to Church Summer Camp. Even though my son is gone, he asked that I work on it anyways. We're getting very close to the October 14th deadline that I set, so I need to get going! 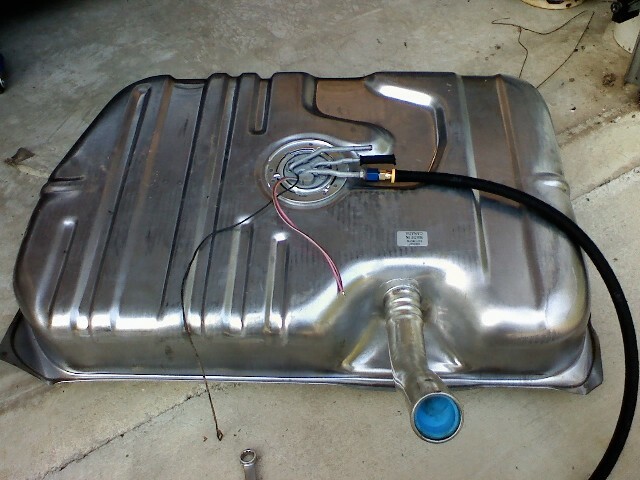 I installed the tank last night after getting all the plumbing fittings and hoses. I used the stock 3/8" steel line as the supply and the 5/16" steel vent line as the return. 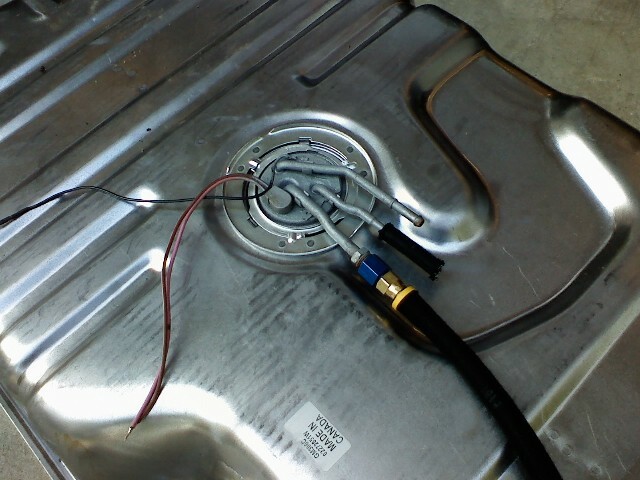 As you can see in the picture below, the sending unit has 3 connections the one on the left is the supply line. The middle is the return and the one on the right is the vent line. * Do some more engine clean-up/paint touch up and re-install intake. * Re-assemble heater box (because I repaired damage with fiberglass patchwork and replaced heater core while I was at it). * Begin on engine wiring harness. thats a good looking car! you got one lucky kid, and sounds like he's got a pretty cool dad. Ok now I'm curious... I'll probably be doing a similar setup to what you have, and using a regulator in the engine compartment for now. What type of fitting is actually connected to the pump? I'm thinking it's something like this, but I'm not positive. What tank is this? Is this the stock Malibu one, or is this a Grand National or EFI Monte tank? Also is that the GN pump that was linked on eBay in one of the threads around here? Thanks for documenting the build so much this is going to make my swap easier.